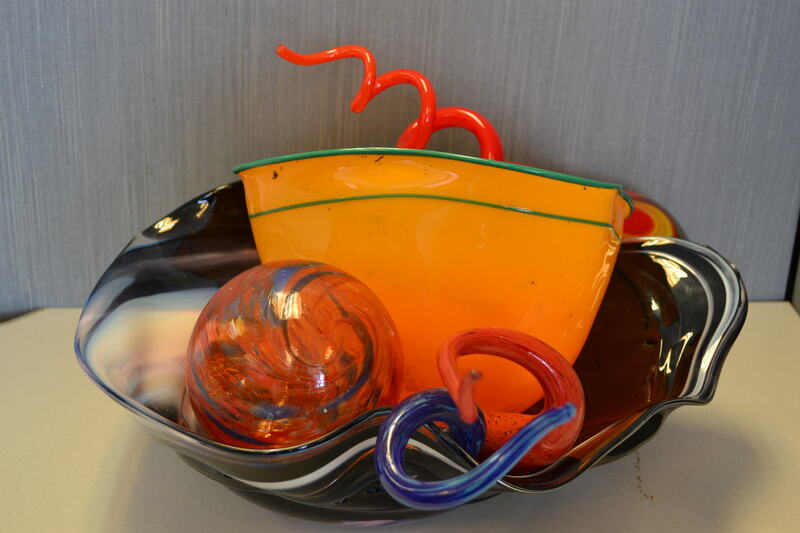 SEATTLE — Jim Coombes was trying to surprise his wife by amassing a collection of works by famed American glass artist Dale Chihuly to donate to Gonzaga University in Spokane, where they’ve worked for decades. They both ended up surprised: It turned out he spent $25,000 on about 100 counterfeit pieces. He bought them from Michael Little, a Renton man who provided him with fabricated documents attesting to their authenticity. With Little being sentenced in federal court Wednesday, the 74-year-old Coombes said he has learned and moved on. He’s still collecting Chihuly art — the real stuff, this time — for the university’s Jundt Art Museum. “I knew I’d been taken, but you get over it and get on with your life,” Coombes told The Associated Press in a telephone interview. U.S. District Judge Robert Lasnik sentenced Little to five months in prison, followed by five months at a halfway house and three years of supervised release, for his guilty plea to wire fraud. The case involved two dozen victims, including Coombes, though the others lost less money. Lasnik ordered Little to repay them a total of more than $75,000, including legal fees for Chihuly’s organization. The judge said he would have preferred to send Little to basic training in the Army, if he had the authority. Citing a doctor’s report to the court, Lasnik noted that Little sleeps until 10 a.m. every day, takes an afternoon nap and spends much of the rest of the time on his computer. The 35-year-old lives with his parents. His father attended the sentencing, but his mother forgot to bring identification to enter the courthouse and awaited her son’s fate at a Starbucks across the street. Matt Diggs, an assistant U.S. attorney, asked for a 15-month prison term. Little’s attorney, Dennis Carroll, sought probation. The judge said prison might do Little some good. “This is a guy who needs to get out of the house,” Lasnik said. Little obtained the generic glass art on eBay and elsewhere, then sold it — mostly through eBay — as bona fide Chihuly, a renowned artist whose sculptures and installations have been displayed all over the world. His customers all told investigators they thought the works they received were real. Chihuly is from Tacoma, where he helped launch the Museum of Glass. A new Chihuly exhibit space and garden opened recently under Seattle’s Space Needle. According to his plea agreement, Little told some prospective buyers his family bought the works after winning the lottery. As early as 2011, some of Little’s online postings were removed because of a fraud alert, but he persisted. Lasnik was unimpressed with Little’s statement to the court. The bald, bespectacled man lumbered to a podium in a sharp black suit — “the first time I’ve seen him in anything other than a hoodie,” his lawyer noted — and proceeded largely to blame the crimes on a mysterious woman who supposedly provided him with the pieces he sold. “I really didn’t know what I was selling,” Little said, contradicting his plea agreement. The judge asked Little if he told investigators about the mystery woman. “I’ve been told not to talk to police,” he said. Lasnik said that deflection could have warranted a longer jail sentence, but he also emphasized the importance of Little getting out of prison, finding a job and repaying his victims. The judge also asked Little if there was anything he wanted to say to his victims. “I’m very sorry for all of the actions that I did and everything I told people to try to get them into buying this art glass,” he said. Coombes is a retired Air Force major and former biplane airshow pilot who works in information technology at Gonzaga. Some of his authentic Chihuly pieces were displayed this year as part of an exhibit to celebrate Gonzaga’s 125th anniversary. Coombes still has the fake pieces. He discovered they were phony only after seeking further authentication before donating them to the museum. He figures he’ll destroy most of them, but some of the better forgeries might still be put to use. He’s talking with the museum about using them as educational tools, to help teach art students the difference between the fakes and the real thing. Published: Nov. 20, 2013, 3:49 p.m.